Nightlife on Boracay, you guessed it, happens at the famous White Beach. One who lives at one of the other beaches is more or less limited to what is provided by the hotel or the resort. But of course, you can simply take a Tricycle to White Beach to participate in the lively nightlife there. The nightlife on Boracay starts already at about 5 pm.. Hundreds of people will gather on the beach to watch the sunset. The sun sinks on the horizon here right in front of White Beach, depending on the season it wanders a bit to the left or right but it is certainly one of the most beautiful places and no mountains or other islands obscure the view. At worst, some clouds or bad weather can spoil the event. At the same time, while people still watching the sunset, the staff of hotels and restaurants are preparing the countless BBQ's along the beach front. For approximately 250 to 350 Peso per person, you can eat there as much as you want and can. Drinks are extra, of course. The buffets are available in many different variations, such as: Filipino Buffet, Seafood Buffet, Italian Buffet, Mongolian Buffet , Korean or Japanese Buffet and much more. Apart from the BBQ's, you can also order from the menu, of course. Between 6 pm and 8 pm, live bands starts playing at many hotels and restaurants. 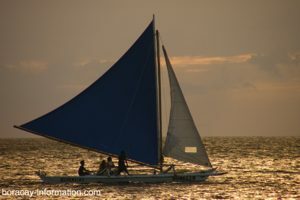 From the romantic folk singer to reggae or rock band, Boracay has it all. Walk along the beach and you will find another live-band playing every 200 meters or so. At the same time, many of the bars and restaurants offer a Happy Hour and you will usually get two cocktails or beers at the price of one. Around 11 pm, it becomes a little quieter along the beach front, when the older generation retires in their hotel rooms and the more youthful revelers populate the bars and discos. Typical bars for everyone can be found everywhere along the beach, the clubs and bars that belong more to the red light district are located mainly in the northern part of the beach (station 1), where the main street is only a few meters away from the beach. Accordingly, those bars and discos are located along the road and not along the beach front.